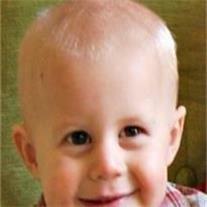 Dylan Dee Brown, 22 months old, San Tan Valley, passed away July 29, 2012 in a tragic accident. He was born September 12, 2010 to Stephanie M. and Charles Lee (CJ) Brown III. This eternal family includes an older brother Charlie and a younger sister Hannah. A large extended family of great-grandparents, grandparents, aunts, uncles, cousins and many friends have been left truly brokenhearted. Dylan gave us all a lifetime of love and laughter in his short time here on earth. His life was taken away too soon. Funeral services will be Saturday, August 4, 2012 at 11 AM at the LDS Chapel located at 33794 N. Gary Rd., Queen Creek. Visitation will be from 9:30-10:45 AM. ALL are welcome to attend! Burial at the City of Mesa Cemetery. An account has been set up at Desert Schools Federal Credit Union.